Princess Anne wore a really lovely embroidered coat for Ladies' Day, pairing it with pearl jewelry. Ladies' Day means one thing in particular: Yorkies! Princess Beatrice, of course, wore no jewelry at all -- but I think she looked really chic and elegant. Princess Eugenie also went largely jewel-free, but we did get a glimpse of a bracelet. Her hat also seems to have some sort of jeweled embellishment attached at the top. 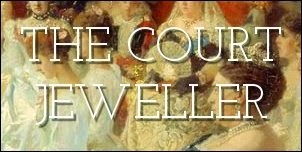 The Countess of Wessex wore the same set of cluster earrings/brooch that she's been wearing often lately. I quite like her hat, though. ...and, disappointingly, that's just about it on the royal front. To make up for the relative lack of hats and bling, here are some royal gentlemen wearing their very dapper top hats! Prince Philip wore a snazzy tie with his top hat and carnation. And Prince Andrew went with a pink tie and a classic black hat. Stay tuned for more Royal Ascot coverage here this week, plus a post later today on the events commemorating the Battle of Waterloo!